Since my stables are almost full (Dear Blizz: Please give BM hunters bigger stables! 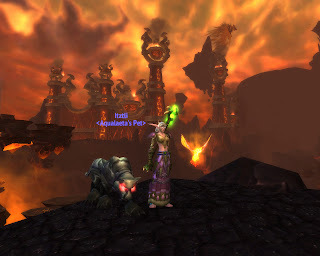 ), I thought I'd do a post and show you some of my favorite and most often-used pets. If you're looking for something cool for your own hunter, I also recommend Petopia, where you can browse pets by looks and family. Also, if you don't have it already, get the _NPCScan addon to track rares. _NPCScan.Overlay isn't a bad idea, either. You'll probably notice a preponderance of cats. I have three in real life and a heck of a lot more in game. I just like them, OK? 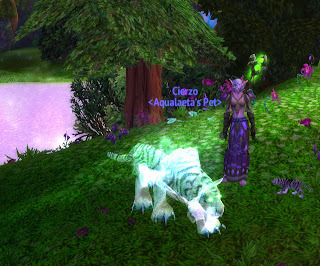 I'll do more posts later with some of my other hunter pets. This is my favorite cat, who sadly lives in my stable almost all of the time. She doesn't have any super special abilities, so she gets passed over in favor of pets who do. 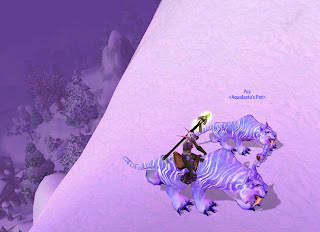 But I love Winterspring, and I love the Frostsabers. She's named after one of my actual cats, who is also stripey, though not purple. Of course I have the matching mount and non-combat pet. Getting everyone in position for this screenshot was like, er, herding cats. I'm still trying to come up with a mail transmog look to match them all. 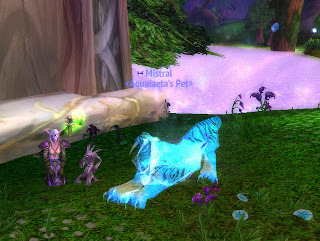 This is not a rare pet, but I get a lot of whispers asking me where I got it: Go to Winterspring and find a Frostsaber Pride Watcher, et voila. These are the two Spirit Beasts I use most frequently. Their Spirit Heal ability is pretty useful when you're farming, say, Lovely Charms in Throne of the Tides. I used to use them in raid fights where we needed just a little extra healing bump (a very little one) but we're past that now, so they just sit around with me in Stormwind and head out for solo battles. The NPC beasts are two of the challenge tames located in Mount Hyjal, and require you to basically strip down so they don't one shot you. How can you argue with that? I got Cierzo (Ankha) first, but I like Mistral (Magria) better because of the blue tint. They're named after the Mediterranean wind; same direction (northwest), different languages. This is Skarr, of course, who hangs out in the Molten Front on a rock platform. He shares a spawn timer with a similarly stony crab, Karkin. This guy took me forever to actually find. Certain hunters who already have him apparently find it amusing to go to the Molten Front and just sit near the spawn points with their tamed pet out, so they can set off your NPCScan and trick you. I hope you guys have to spend, like, 10 months camping to try to get Ban'thalos or something. (NB: I checked the zone for hunters and made a little announcement before taking this screenshot, so no NPCScan caches were harmed.) Mine is named after an Aztec god of stone. I don't actually especially care for this appearance, but I swear he does better DPS than other cat pets, so he's the one I raid with. So there you have four of my cat pets. I've got more of them, but we'll save those for another day.